The 35th Infantry Regiment Association salutes our fallen brother, 2LT Clovis Tim Ray, who died in the service of his country on March 15th, 2012 in Kunar Province, Afghanistan. The cause of death was listed as IED. At the time of his death Clovis was 34 years of age. He was from Three Rivers, Texas. Clovis joined the Army April 20, 2010, and is survived by his wife and 5-year-old son. His awards and decorations include the Bronze Star Medal (posthumous), Purple Heart (posthumous), two Army Commendation Medals, National Defense Service Medal, Afghanistan Campaign Medal with Bronze Service Star, Global War on Terrorism Service Medal, Army Service Ribbon, Overseas Service Ribbon, NATO Medal (posthumous), Combat Infantry Badge and Parachutist Badge. I regretfully must tell you that we recently lost one of our very own Cacti Soldiers and Leaders last night, here in Afghanistan. 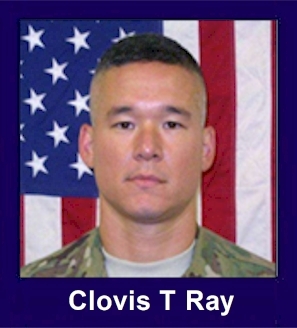 2LT Clovis Ray died of wounds suffered while conducting a combined patrol in the Pech River Valley when his element was attacked by the enemy using an Improvised Explosive Device (IED). On the evening of 15 March 2012, 3rd Platoon, Delta Company "Gundogs" was conducting a combat patrol in the Pech River Valley in Central Kunar Province. While conducting a dismounted clearance of an area, an explosion occurred which resulted in the serious wounding of 2LT Clovis Ray. Unfortunately, he later died of his wounds. 2LT Clovis Ray is true hero, and was a phenomenal young rifle platoon leader. There are none better. He is survived by his wife, son, and his parents. Please join me in keeping the Ray family in our prayers and give them strength in this trying time. Please keep the Family and friends of our fallen comrade in your prayers. The Clovis T. Ray Scholarship Fund has been established. The family plans to offer the scholarship each year to a socio-economically underprivileged good student from Three Rivers. The recpient must show leadership skills and the desire to go to college, and does not have other scholarships or the means to advance their education.